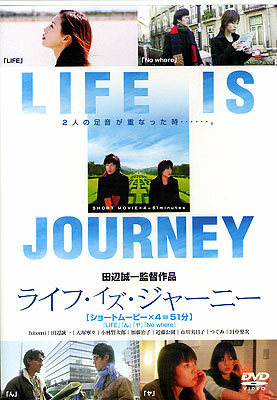 Life Is Journey" is a compilation of four short stories. The characters all yearn to connect with others, while dwelling in their solitude. Accidental encounters and reluctant partings overlap joy and pain on a daily basis – yet no two days are alike. "Life" portrays half of a woman's life in one-scene, one-cut, nine-minute sequence. "N" is a comical take on a man abandoned by his lover. "Ya" explores the bond of female friendship as one woman consoles a brokenhearted girlfriend. "Nowhere", a man and a woman roam the streets of a foreign land in search of lost time.